I can’t even deal with these photos. I want to lick my screen even though I have this whole platter of caramel pull-aparts in my kitchen. This breakfast is monkey bread on steroids, that’s for sure. And it’s going to be your new favorite, I promise you! So, Jordan walked into my kitchen this afternoon and her head exploded. I mean she saw this plate and shrieked “MONKEY BREAD! IS IT CHRISTMAS?” and I had to break it to her that it was not Christmas and there were no presents. Also that there was no monkey bread to which she looked at me like I had two heads. This gooey, doughy concoction is a Caramel Pull-Apart. But we can also call it Monkey Bread because, um, it’s both. Or, rather Monkey Bread is also a Pull-Apart. Like soda and pop. Which one is it? It’s so confusing. I’m rambling now. It’s the drool, I can’t help it. I mean…just look! This recipe comes from my very good friends over at Six Sisters’ Stuff. You know about them, right? They have an amazing blog and I’ve been reading them for years. Their blog is full of yummy recipes, fun crafts, home decor, family ideas and so much more. And they’ve written another cookbook! The newest book, 12 Days of Christmas with Six Sisters’ Stuff, is full of recipes, DIY decorations, homemade gift ideas, crafts, and party ideas that are all perfect for the holiday season. And also in the book? 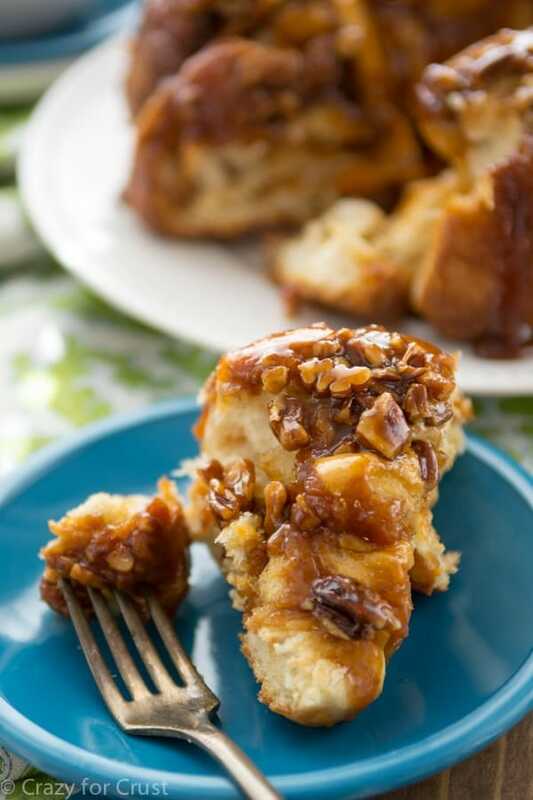 This amazing Gooey Caramel Pull-Apart Recipe! If you’ve been here any length of time, you’ll know that Jordan expects monkey bread every Christmas morning. That girl is all about her traditions…and to her once is a tradition. We had monkey bread for breakfast on Christmas when she was 2. And she’s demanded it every year since. When I saw this recipe I immediately knew it was the first recipe I was going to make from the 12 Days of Christmas book. It’s such an easy recipe and it’s so, so good. Can I tell you a secret? 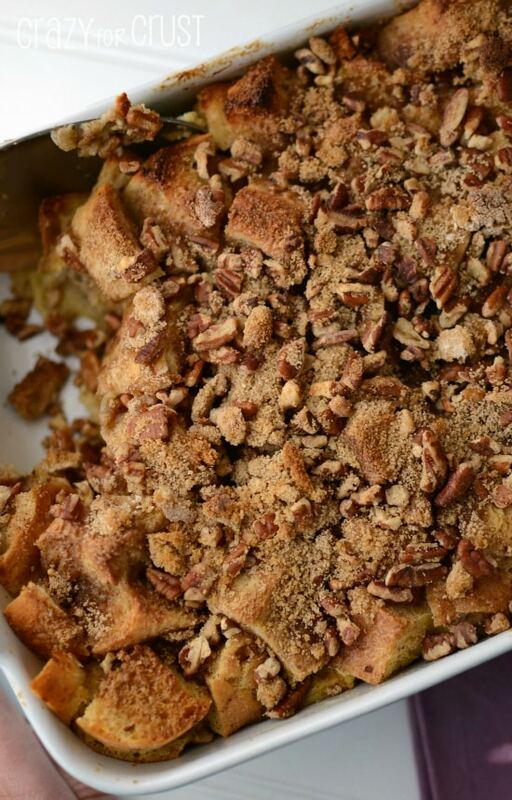 I liked this more than my traditional monkey bread! The recipe starts with frozen dinner rolls – the kind you let unfreeze, rise, and then bake. I used Rhodes dinner rolls, since that’s what they carry at my grocery store. You let the rolls just defrost, then you cut them up and make the pan of pull-aparts. Then you have to let the rolls rise for bout 8 hours or overnight in the refrigerator. I didn’t want to wait 8 hours because, if I’m being totally honest, I didn’t read the recipe all the way through before I started. BAD FOOD BLOGGER. But, I was also baking other things the day I made this, so my oven was on and my kitchen was warm. I made the pan of pull-aparts and left it on the stovetop and, from the heat of the oven, the rolls rose in about an hour. If you want to skip the rising time altogether, I’m almost positive you can substitute Pillsbury Grands! Biscuits for the dinner rolls. I put a note in the recipe about this but it would just need to be assembled and baked, no rising time. 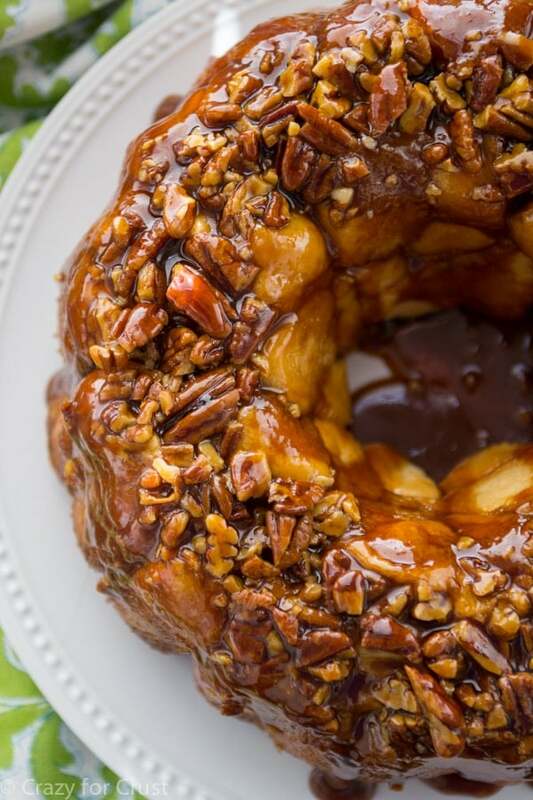 The secret to this caramel pull-apart? Pudding mix! I swear, pudding mix is the magical ingredient in everything. It makes cookies moist, it adds flavor to milkshakes and ice cream, and now it has a home in breakfast. The recipe calls for butterscotch cook-n-serve pudding. Be sure not to grab instant! The pudding gives the caramel on top a rich golden color as well as so much flavor! My favorite thing about this monkey bread is that, unlike traditional monkey breads where the roll pieces are rolled in cinnamon sugar, these aren’t. That makes the end result sweet but not head-rush-hurt-your-gums sweet. 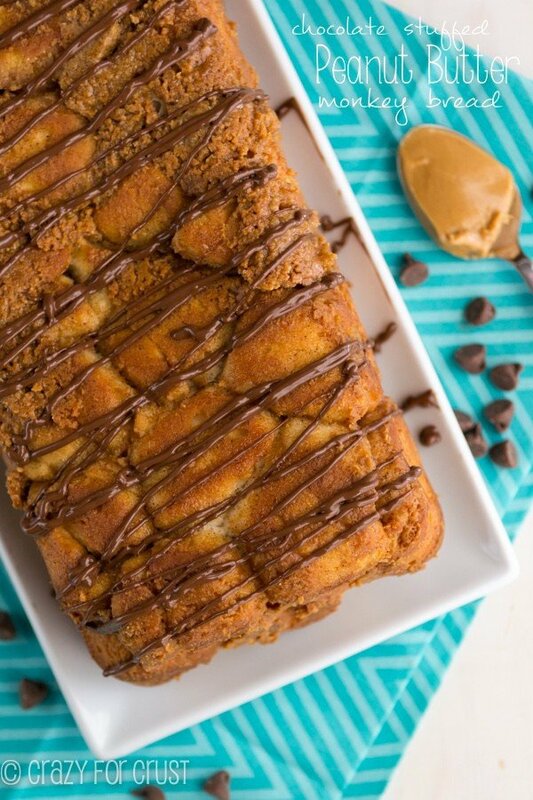 The caramel and the bread and the nuts combine to make the perfect breakfast treat. Make this for Christmas…or just because you need it. I mean, don’t the photos make you want it bad? Sigh. I’m heading back into the kitchen now. Darn you gooey pull-aparts! This recipe is going to be your favorite fancy breakfast! 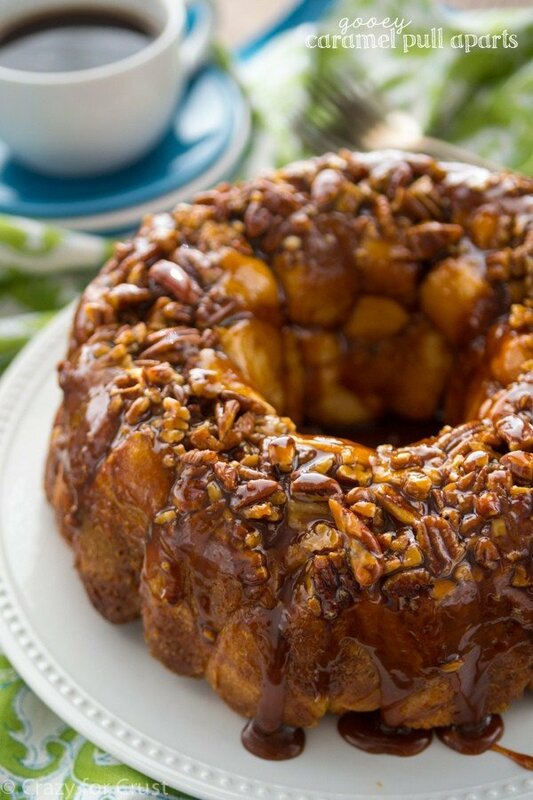 Easy frozen dinner rolls are transformed into a gooey caramel pecan monkey bread! Thaw frozen rolls until they are just thawed (not risen), about 1-2 hours. Use kitchen shears to cut each roll into 6 pieces. Coat a bundt pan with nonstick cooking spray. Sprinkle all of the nuts in the bottom of the pan. Place half of the roll pieces over the nuts. Sprinkle half of the pudding mix over the rolls. Stir together melted butter and brown sugar in a small bowl. Pour half over the pudding mix. Top with remaining rolls, pudding mix, and sugar-butter mixture. Preheat oven to 350°F. Bake rolls for 30-35 minutes until the top is somewhat firm and the center is soft but not gooey-soft. Cool no longer than 5 minutes, then turn pan over on serving dish. Enjoy warm right from the oven! Click HERE for more Pillsbury Dough Recipes! 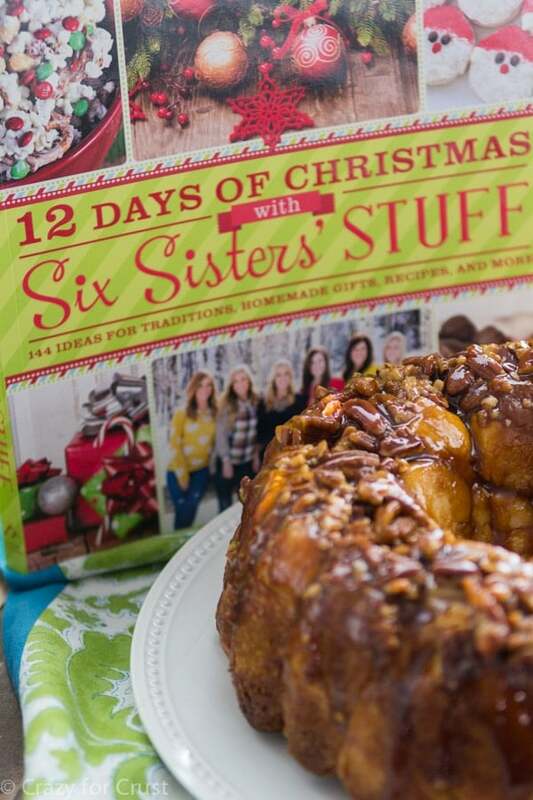 Check out the 12 Days of Christmas with Six Sisters’ Stuff on Amazon today! It has everything you need for the perfect holiday. WOW!! You sure did that recipe justice – it looks absolutely mouth-watering!! And now that’s all I want for breakfast tomorrow 🙂 Pinned!! I have always wanted to make monkey/pull apart bread but have always been too intimidated by the recipe! Thanks for sharing this delicious gooey caramel pull apart bread Dorothy, you definitely have inspired me to give the recipe a go and have more faith in my baking ability! This is so easy Thalia you won’t believe it!! I was wondering what your regular Monkey Bread recipe was? Where can I find it? I pinned this to make this Christmas, but we’ll try it out before that. Thanks! I don’t think I’ve actually ever posted it – it’s the regular one from Pillsbury (http://www.pillsbury.com/recipes/grands-monkey-bread/7a1e41b1-4708-4028-8ce6-fcb5baebbc19). I have a from-scratch one in my book, and I’ve made a few versions (under breakfast) but not a traditional one, except the one with King’s Hawaiian Rolls! and omigoshhhh this pull apart bread!!! CARAMEL GOOEY GOODNESS! Beautiful dish! I would make this to go with a yummy bowl of chili! My mom makes this every year on Christmas morning, although I’m determined to compare recipes because I swear yours looks gooey-er! (Shhhh.) Your pictures of this are unbelievable. I’m confused by this I made it as directions but used canned biscuits So I didn’t have to mess with the rising. It didn’t turn out a gooey wonderful creation. It was dry and powdery. Do I need to make the pudding and then add it to the biscuits? No, I just used the powder. That’s so strange! Maybe you needed more butter? I followed the recipe to a T from the book…so I’m not sure what could have happened. Chances are more butter was needed for some reason. Were you using regular butter or margarine maybe?